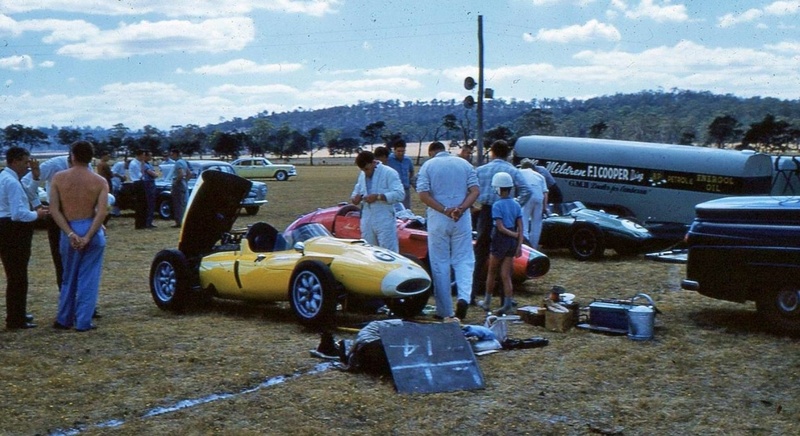 The ‘Rice’ Trailer behind proclaims Mildren and the Cooper as winners of the 1960 Australian Gold Star Championship drivers award and Australian Grand Prix. In racing terms Mildren, than 46 years old ‘had been around the block’, racing forever. This article is about Mildren and the happy confluence of factors that enabled him to achieve Mark Donohue’s ‘Unfair Advantage’, win the titles above and reasonably soon thereafter retire from racing himself to ongoing success as a significant importer, motor-dealer and as a team owner/patron of others. The factors of confluence were experience, his teams engineering capability, his Maserati connections and economic means. Mildren had raced Coopers for years, first a front engined T20 Bristol and then mid-engined F2 T41, T43 and T45, so his choice of chassis was easy! He was a regular enough customer of the boys from Surbiton that they stocked his hue of ‘Mildren Green’ paint. 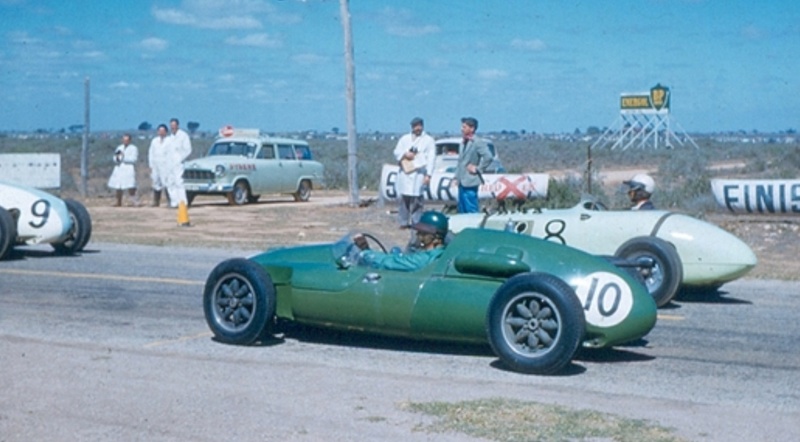 Cooper despatched a brand new Grand Prix T51, chassis ‘F2-22-59’ to Sydney in October 1959. The engine was trickier though. 2.5 litre Coventry Climax FPF’s were as rare as hens teeth at that time in the hands of privateers as the works F1 teams had a mortgage on supply. 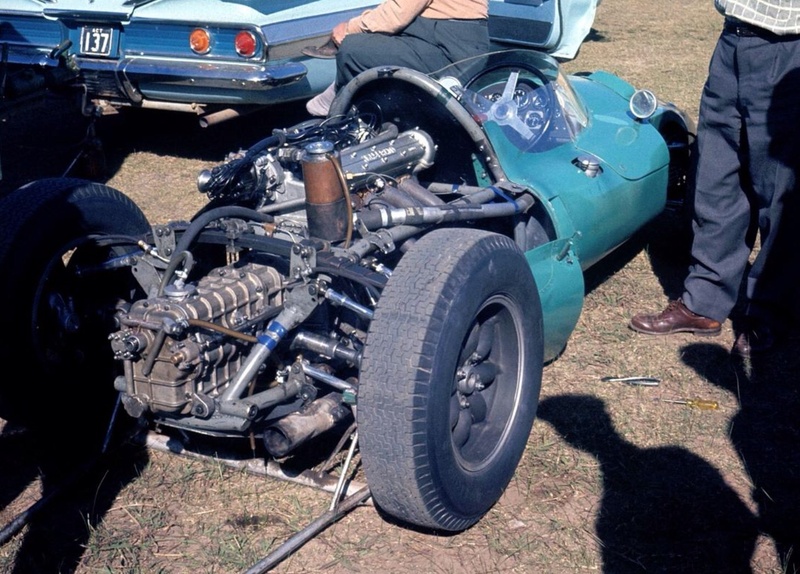 The only dude in Australia who had one was Frank Matich, it was fitted to a Lotus 15 he acquired in the UK- the car was a formidable weapon in Australia’s National F Libre category but not a race winner in Gold Star competition in other than exceptional circumstances. Alec’s single-seater competitors- Bib Stillwell, Bill Patterson and Austin Miller would all be making do with 2 or 2.2 litre FPF’s for a while at least. 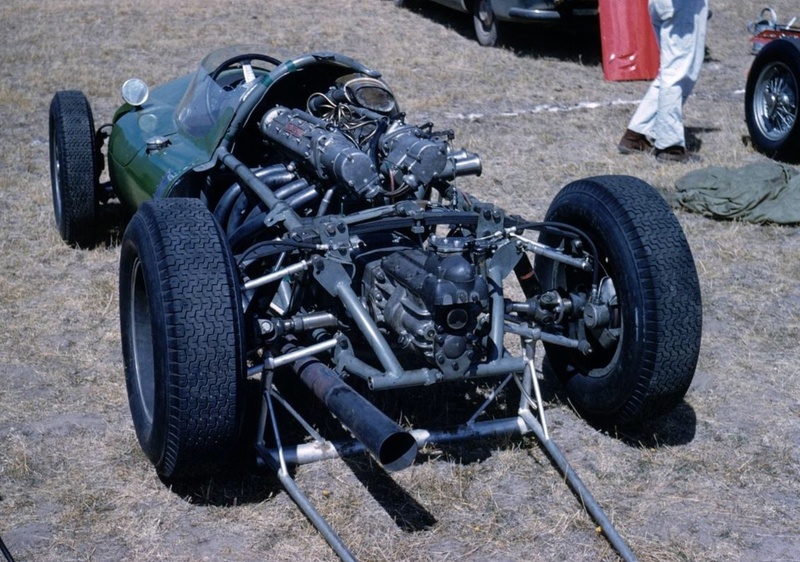 The successful Maserati 250S engine, front mounted of course in its original environment, was more of a chellenge to fit, but it could be done, Glen Abbey and Alec had the skills and critically the engine was available, sorted, powerful, and could be acquired by a privateer. And so it was the Canberra racer cleverly adapted the engine to chassis and gearbox, tested it and then went out, beat the best in Australia and then retired to become the patron, mentor and entrant of Ralph Sach, Frank Gardner, Kevin Bartlett, Max Stewart and others. 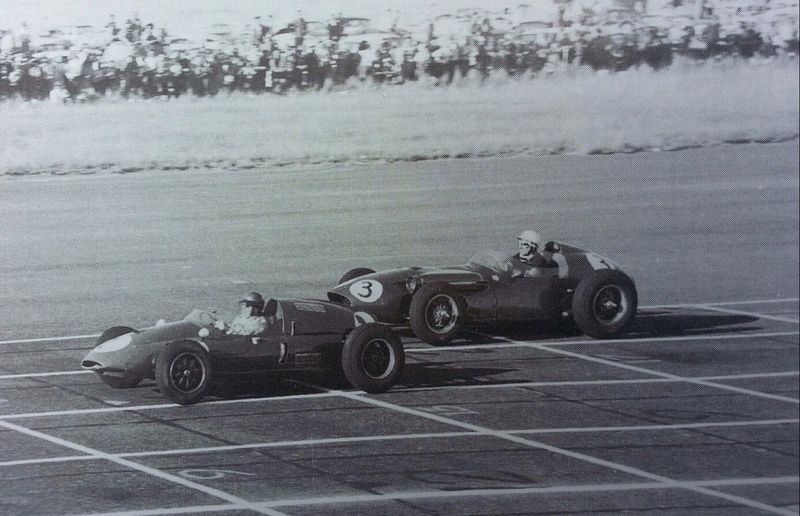 Mildren got his timing precisely right- by the start of 1961 he was approaching 46, 2.5 FPF’s were arriving in Australia and Stillwell (born 1927) and Patterson (born 1923) who had also been racing for a long time, but were younger than Alec were starting to peak- win and call it quits, who can argue with that as a good strategy for a professional sportsman? Mildren was a thoroughly decent man, racer and businessman, the General Motors, Alfa Romeo, SAAB etc dealer was one of those fellas who put far more into motor racing than he ever took out of it. By the time Alec was born in 1915 at Burwood in Sydney’s inner southwest his father had already established a good business as a master-builder to service the needs of the rapidly growing populations need for housing. Mildrens interest in cars was whetted at an early age by Vauxhalls his father owned- a 14/40 Speedster and 30/98. Alec’s drive and determination was no doubt in part due to the difficult circumstances in which he was raised. On the way back from a holiday over the 1930 Christmas period the family were returning home to Sydney when a tyre of the car his father was driving blew causing the car to roll. Both his parents were killed in the accident, with Alec in the back seat the only survivor. One can only imagine the trauma the 15 year old boy/youth felt. He moved in with his 10 years older brother, wife and family but did not last long, moving out to live on his own aged 16. The brother continued the family home constrction business. Inner city Darlinghurst was a tough place for a youngster to be but Alec moved into a small bed-sit, and despite the economic savagery of the depression found work pumping fuel and as a milkmans mate. On long walks on the weekend he would surf at Bondi and take a shower. Before too long he walked into the naval depot in nearby Rushcutters Bay, saw a recruitment ad and joined up. His timing was perfect, having run down the military with budget cuts for years the Australian Government were putting money back into defence as global uncertainty increased- Fascism was on the rise most notably in Germany and Italy. He was posted to the Communications Centre as a consequence of his education, he had completed his Intermediate Certificate whilst living with his brother. He was later posted to the Flinders base in Victoria and served in the Mediterranean. On a trip to the UK in the late thirties he visited Brooklands and saw the German cars at Donington. He returned from this trip with some goodies for his Austin 7 Ulster- a Laystall crank and rods, Scintilla magneto and a close ratio four-speed gearbox. By this stage he had met future wife and life partner Marjorie- they were married in August 1939 but soon he was off to War together with most of the other young innocents on the planet. He saw active service in intelligence operations aboard HMAS Hobart in Europe but was invalided out of the Navy as medically unfit after a bad fall aboard ship. After return to Australia and release from Randwick Hospital he sat his accountancy exams- having studied in his spare time whilst in the Navy and soon commenced working for what is now Price Waterhouse Coopers as an auditor in Sydney. In 1942 son Jeffrey arrived. He soon moved to The Department of Supply and ‘backyarded’ some used cars- how many racers have motor-trading in their CV?! In a further example of his entrepreneurial flair he bought a cab in 1944 and did very nicely ferrying cashed up ‘Yanks’ around Sydney on shore-leave from ships fighting in the South Pacific, in the same year second son Raymond was born. At the end of the War Alec sold his ‘taxi-plate’- his licence for a tidy sum and again dealt in cars. Soon he was also employed in the game by ‘University Motor Auctions’. At about the same time he started his long racing career with the purchase of a Singer Le Mans, this was soon replaced by the ex-Ben Tarr Ford Spl. As Mildren’s business flourished so too did the quality and competitiveness of the cars he raced. In Melbourne his fellow contemporary racers Stan Jones and Bib Stillwell were on similar racing and car dealing journeys- Jones with only his own resources like Mildren and Stillwell with adequate family backing to ease his way into the game. The Mildren family decision to set up shop in Canberra was made after a number of trips ferrying cars from Sydney to Canberra to a friend who was operating from the national capital. He and Marjorie acquired some land in Lonsdale Street, Braddon and built a small dealership premises and an adjoining flat in which they lived. All of the profits of the business were ploughed back in to finance stock- soon they applied for, and were granted General Motors franchises for Vauxhall and Bedford. 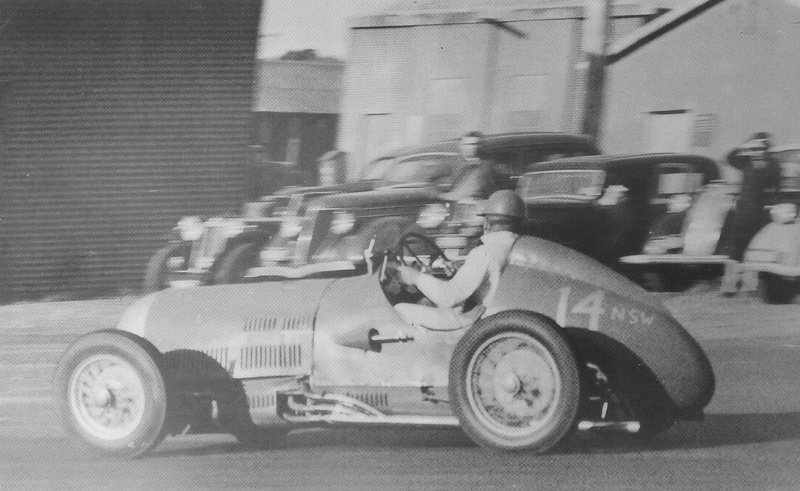 Whilst the family lived modestly behind the dealership Mildren continued to race contesting the 1948 Australian Grand Prix at Point Cook in Melbourne’s west aboard a self-built AGM Ford V8 Spl he built in 1947. This was replaced by an MG TB he ran from circa 1949 to 1951 prior to acquisition of the ex-John Snow Dixon Riley which was completely rebuilt upon purchase in 1951, but still gave plenty of grief in terms of the cars speed and reliability! In 1953 he bought a very famous MG, Alan Tomlinson’s MG TA Spl which won the 1939 AGP on Australia’s most daunting road circuit, Lobethal in South Australia’s Barossa Valley. He replaced the old war-horses heavy body with a Clive Adams built central-seat aluminium one which slipped through the air nicely. The mechanically very capable Alec replaced the TA engine with a supercharged TC unit and close ratio gearbox. The car was very quick- Alec accepted an offer from Curley Brydon to buy it after the Gnoo Blas meeting in 1953. His passion for Rileys undiminished, he next bought the Rizzo Riley before buying his first ‘outright in the right circumstances’ contender, the ex Rodney Nuckey Cooper T20 Bristol which made its debut at Mount Druitt in 1955. Jack Brabham’s T23 would have been a better purchase when ‘Blackie’ went off to seek fame and fortune in The Land of The Pom but Stan Jones ‘nicked’ that machine from other locals in his ever expanding garage(s). 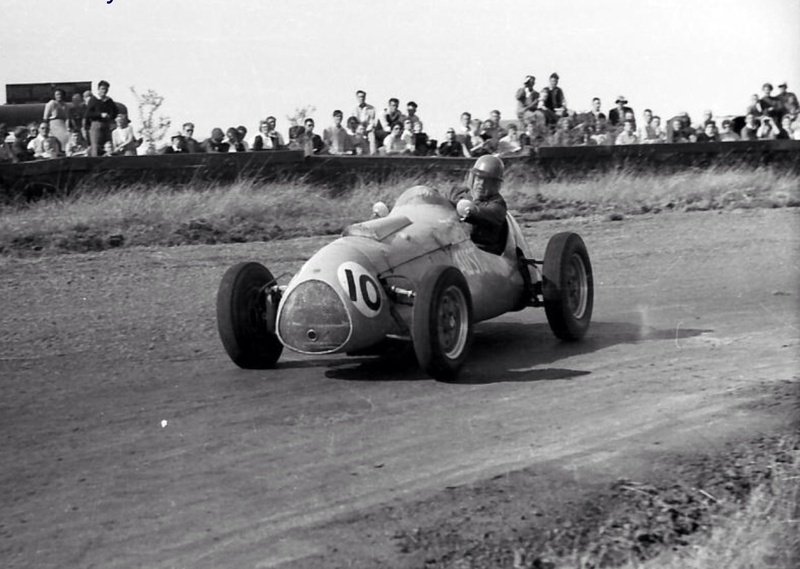 Acquired in the UK, Alec’s new car was a serious bit of kit which had won the 1953/4 Helsinki GP’s. He remembers the car mainly in a positive way, he liked the cars handling, braking and steering- ‘I won a few short races with it, but no long ones of any consequence. I can’t say that I went out to buy Bristol engines- the one I had was very temperamental’. In long Australian careers all five of the T20/23 Cooper Bristols which came to Australia had their engines replaced by either Holden ‘Grey’ six cylinder engines, sometimes fitted with a Phil Irving designed Repco ‘Hi-Power’ head or Chev Corvette V8’s. A mistake in the cars preparation when a fuel line leaked onto the exhaust during the Argus Trophy at Albert Park hospitalised the gritty motor-trader overnight and took a while to recover from but his increasing flair was on display at his first post-prang meeting at Southport, Queensland when he finished 3rd behind Lex Davison’s Ferrari 500/625 and Stan Jones Maybach in November 1955. 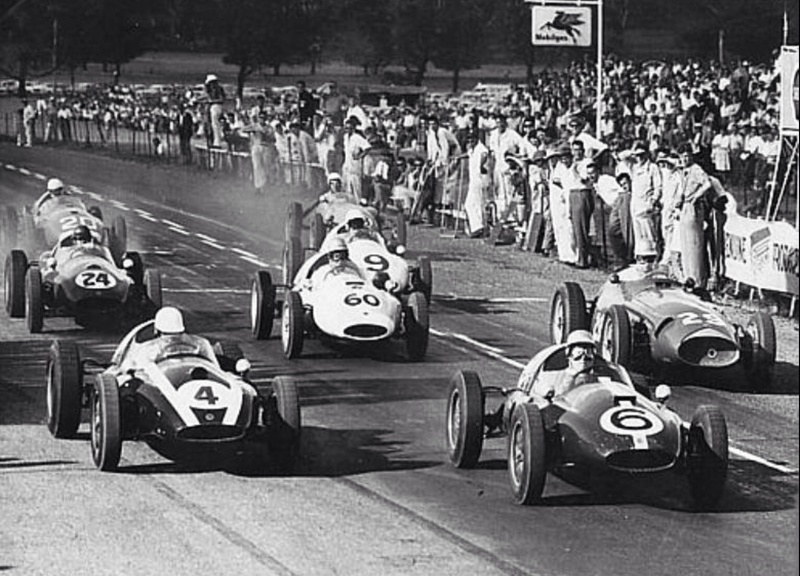 The organisers of the New Zealand Grand Prix invited him to contest their 1956 event at Ardmore but the Cooper had the look of a start-line special when the Bristol engines head gasket blew having covered only 20 yards after the start. 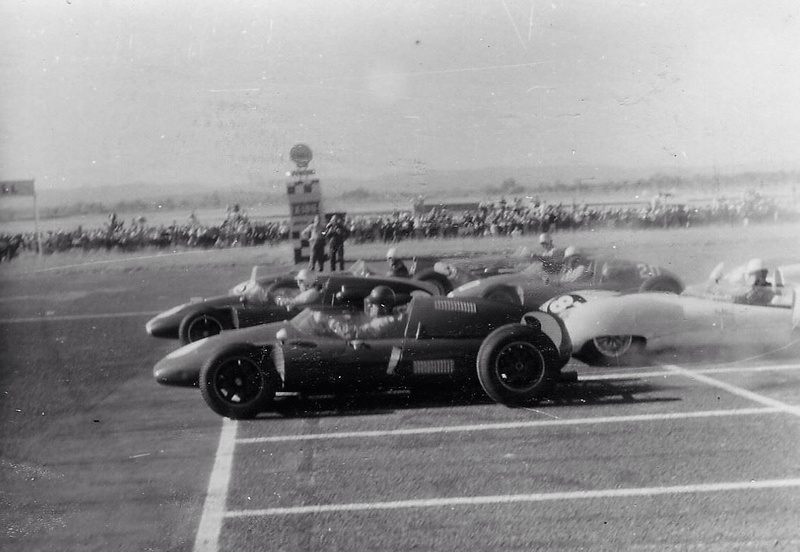 In late 1956 he also commenced racing an Aston DB2/4- profits were on the up! 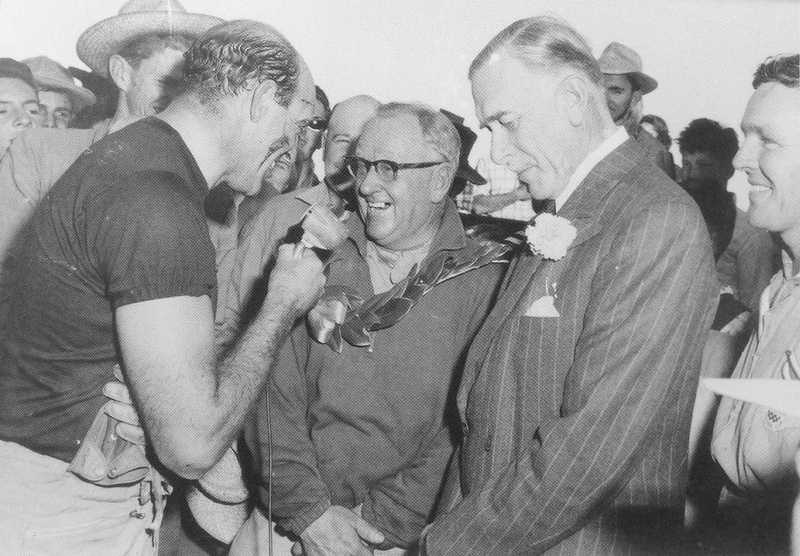 After the 1957 AGP at Caversham, Western Australia, with Alec fifth in a race famous for its vicious heat, he sold the car to local gun, Syd Negus. Mildren went mid-engined for the first time with purchase of Jack Brabham’s 1956 Oulton Park Gold Cup winning F2 Cooper T41 Climax FWB. By now the self-fulfilling prophecy of better cars giving better results was clear to Mildren- if that was ever in doubt! 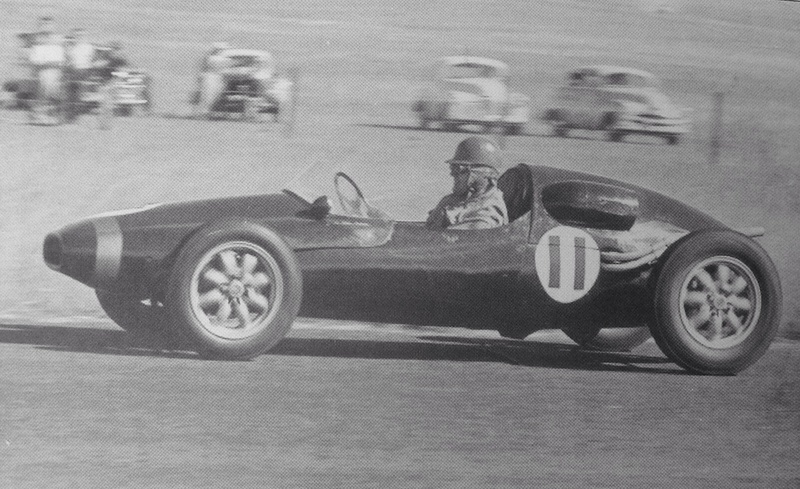 His next acquisition was his first ‘brand spankers’ racing car- the latest F2 Cooper T43 Climax FPF 1.5 twin-cam. 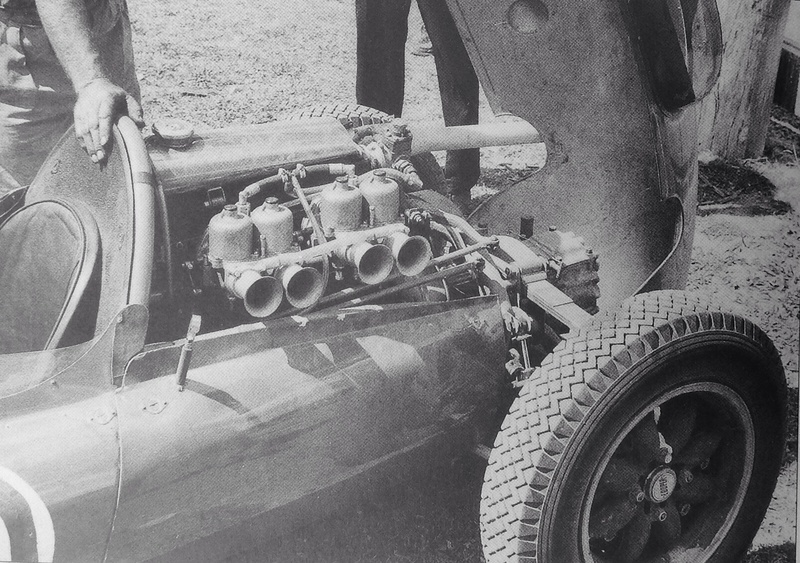 Mildren wasn’t convinced it was much better a car than its predecessor until taken out to 2 litres with a liner kit, pistons and sleeves he sourced from Coventry Climax via Jack Brabham. In that form he contested the ’58 AGP at Bathurst finishing 7th in the race having been hit during practice and pitting twice. He won the ’58 Queensland Road racing Championship and Lowood Trophy- beating Stan Jones and Reg Hunts Maser 250F’s, the first time in Oz a Cooper had beaten the Big Red Cars. 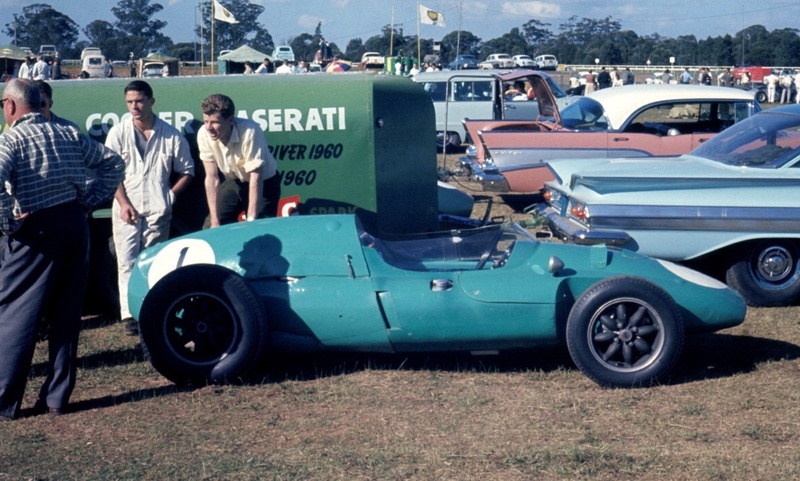 This car was sold to Glynn Scott who raced it successfully with Mildren buying a new Cooper T45- delivered to Melbourne prior to the 1958 Melbourne Grand Prix, Alec and Glenn Abbey, then a youth who would become a longtime Mildren mechanic/engineer fitted the 2 litre FPF from the T43. Alec was in with a shot for the ’58 Gold Star along with Stan Jones and Len Lukey but Stanley won the final round at Phillip Island aboard his Maser 250F and took the title he so richly deserved. Like Alec he was a perennial racer who had been competing nationally for almost as long as Mildren. In many ways Len Lukey’s successful 1959 Gold Star campaign was a prototype of Alec’s in 1960- buy the very best Cooper available, contest all the rounds with adequate back-up, drive fast and well but play the percentages, and the title will surely be yours. Lukey won at Caversham and Phillip Island and whilst Alec was victorious at Fishermans Bend and Lowood twice, Lukey took the title by only 2 points from Alex with greater consistency. The title could easily have been Alec’s were it not for some misfortune during the Bathurst 100 round. He led until the 5th lap and then pitted to secure the loose bonnet cover having been black-flagged. He re-entered the race and with red mist in his eyes was up to 2nd behind Ross Jensen’s Maser 250F when a conrod bolt broke- he shut the engine down, but it cost him 6 valuable points to Lukey. When they tore the engine down there was damage only to the conrod- the precious crank was ok. The Maserati engine was no fluke, the approach to the factory was a function of Mildren ‘selling a few at the time’, he was an accredited dealer of the marque. 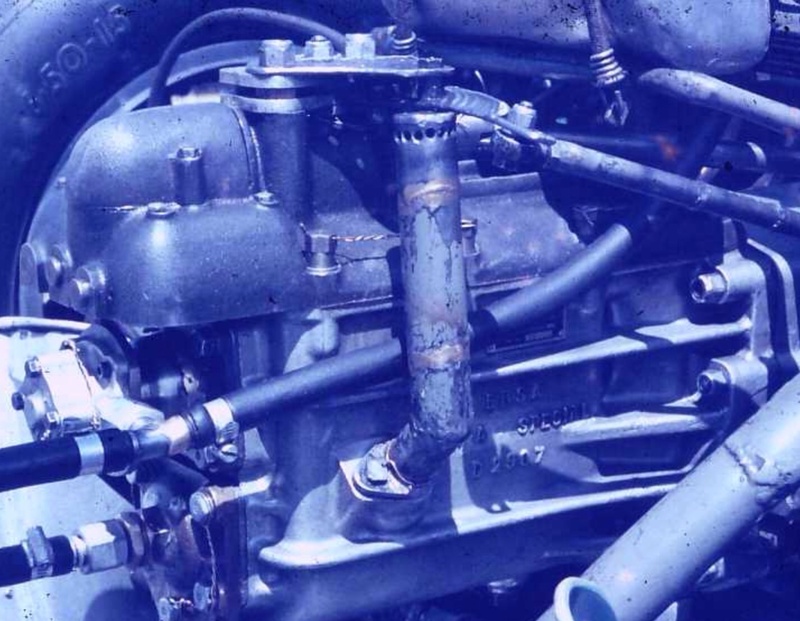 The Cooper Masers in the UK suffered chronically from overheating so Mildren specified his to be built to suit methanol fuel, with the motor having a higher compression ratio than usual. 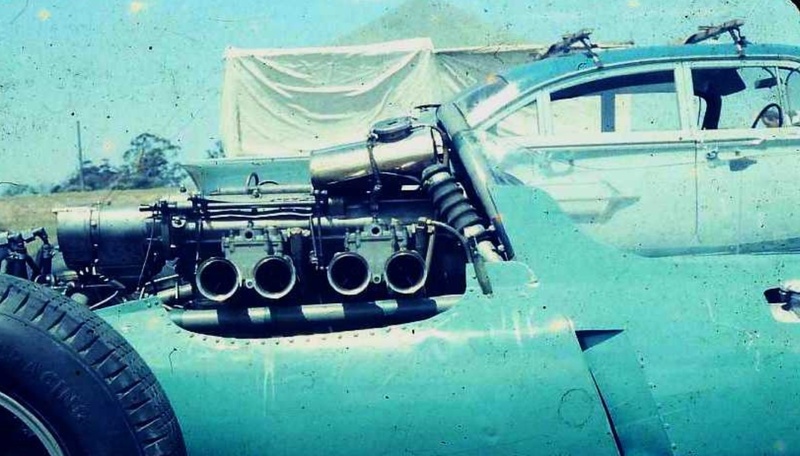 These engines were fitted to the (1957) Maser 250S sportscar- four of which were built so fitted. 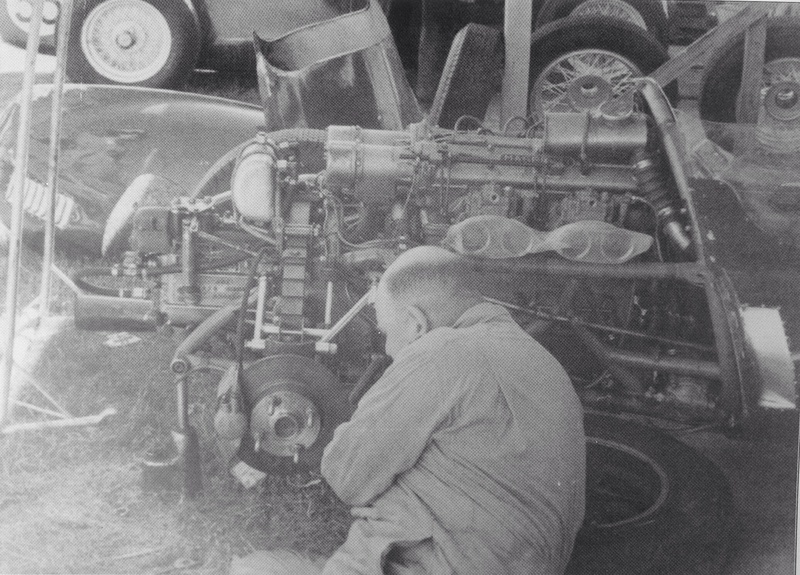 Other 250S engines were fitted to update earlier Maser sporties with some sold to customers and fitted into other chassis’. Initially the Mildren car used a Cooper Jack Knight splash-fed gearbox, later Alec acquired a pressure-fed ‘box from Jack Brabham after the Longford 1960 meeting. ‘This helped but by no means solved one of the cars problems, the fragility of its earlier model Cooper gearbox. The punch of the Maserati engine could still create little indentations on its bronze bushes, and easily peel the teeth off first gear, even with careful treatment Mildren described it as a “one practice, one race” gearbox before it needed overhauls’ Graham Howard wrote. Despite the bulk of the 250S engine in relation to the mass of the 2.5 CC FPF for which the T51 chassis was built, Mildren and Abbey were able to mount the engine lower in Owen Maddocks frame than the taller FPF. One top chassis tube was modified to clear the twin 48 DCO Webers, the Cooper chassis ‘slightly strengthened’ with water and oil radiators enlarged due to engines requirements, a learning from experience with the motors use in the UK. The team also managed to fabricate driveshafts of equal length, unlike the Cooper Masers in the UK. An adaptor plate or bellhousing was cast and machined locally to mate engine to gearbox and exhaust pipes were fabricated to clear the frame and ancillaries to dimensions specified by Maserati. The motor gave circa 270 bhp @ 7800 rpm- more than enough to do the goods amongst the 1960 Oz competitor set. Let’s not forget that the car was the first full Grand Prix specification machine Alec had driven, he was stepping up a class from what had gone before. The season started well with a win in the Cooper T45 Climax at Gnoo Blas, Orange in late January. Alec won the South Pacific Road racing Championship during the Australian Touring Car Championship meeting averaging 103 mph and taking a second off Brabham’s lap record. He sold the car at the end of the weekend to future CAMS President John Roxburgh. 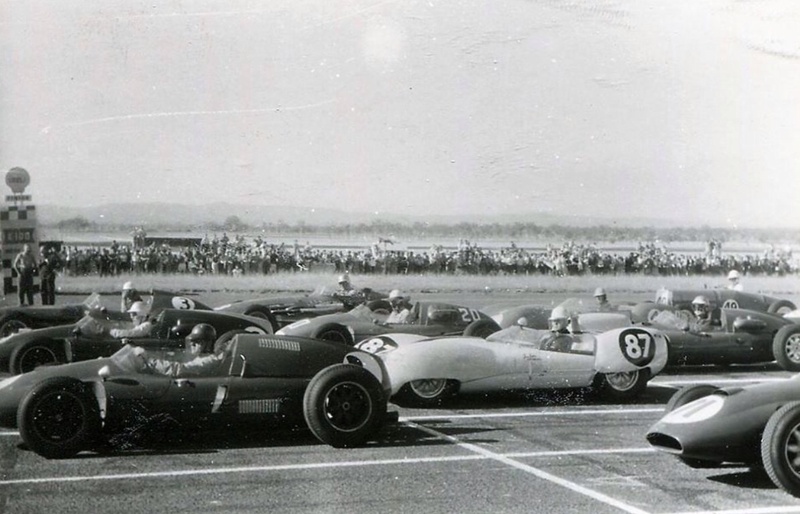 The 1960 Gold Star season started with the International meetings, the frst of which was at Longford in early March, there Alec was 2nd behind Brabham’s Cooper T51 2.5. 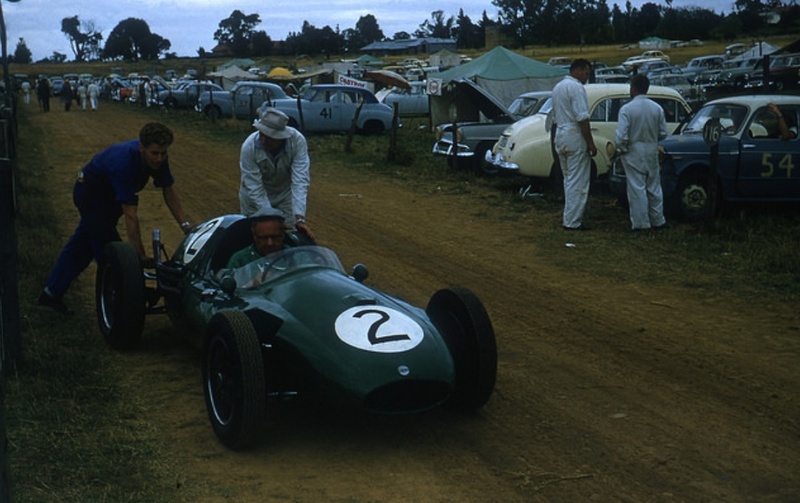 Whilst in Tassie he accepted an invitation to compete at the opening Symmons Plains meeting- he and Arnold Glass’s 250F entertained the crowds with lots of passing but the Cooper Maser took the honours and its first win. At Easter for the Bathurst 100 Mildren took a dominant win with the car timed at 160.71 mph over the flying mile. Glass was 2nd and Bill Patterson 3rd in Maser 250F and Cooper T51 FPF 2 litre. 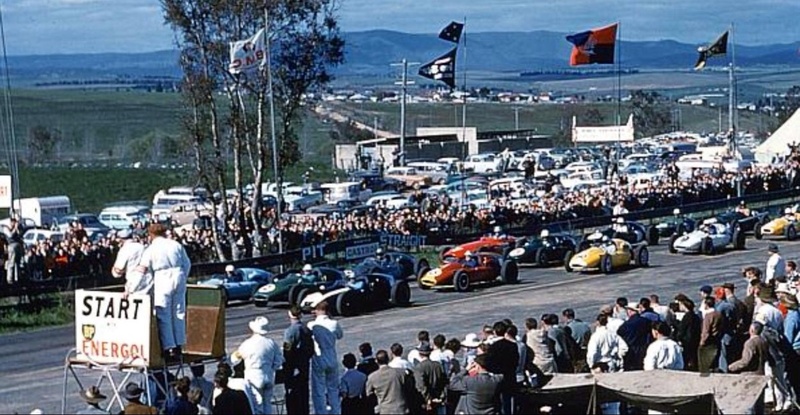 ‘The victory was immensely popular with 25,000 spectators, the crowd giving him one of the loudest ovations then heard at the popular track…to slash more than five minutes from Ross Jensen’s record time’. The next race was the big one, that year the Australian Grand Prix was held on the Lowood, Queensland airfield circuit. Alec’s track record there was impeccable- he was without doubt the fastest combination in Australia but a wildcard was thrown into the mix with ‘Dame Nellie Melba’- Lex Davison returning from retirement again to race an Aston Martin DBR4 GP machine powered by a methanol fed DBR1 3 litre sportscar engine. The cars were hopelessly outclassed in GP racing- the front engined machines were too heavy, underdeveloped and arrived two years too late just like Lance Reventlows Scarabs. Some writers describe them as the ultimate expression of the front engine GP car but that does a grave disservice to the Lotus 16 Climax and the 1960 Ferrari Dino 246. Nonetheless, in Australian F Libre with wily, fast Davo behind the wheel the car was very much a contender, as events proved in spades. Wide and open Lowood suited the Astons long legs, were the race at Bathurst or Fishermans Bend it would have been a different matter, perhaps. Davison described the Coopers as ‘anti-Climaxes’, he was said to be emotionally attached to the front-engine machines like his Ferrari 500/625 but he was well aware of the Coopers potency given his hillclimb and short-circuit successes in his own air-cooled Coopers- and of course he was to race the machines in the coming years inclusive of a 1961 Mallala Cooper T51 AGP win. Still, Davo’s choice was an interesting one as he had the wealth to pick and choose from all the options. Davison had practiced the car at Goodwood and Phillip Island where he was 2 seconds from Brabham’s lap record. 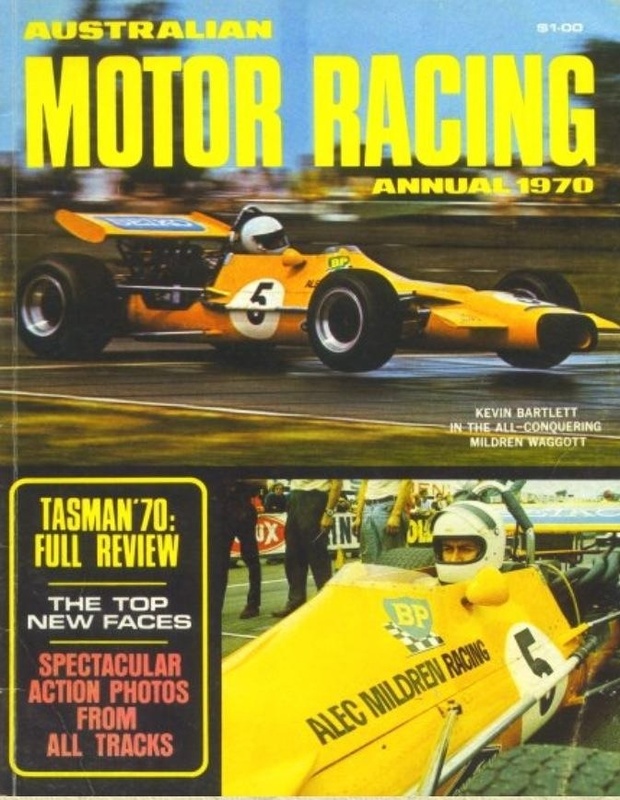 The following excerpts are drawn from racer/team owner/journalist David McKay’s Sunday Telegraph and racer/historian Graham Howard’s ‘History of the AGP’ race report/chapter. McKay wrote ‘Davison came to Lowood supported by his experienced crew…he drew first blood by winning the champions scratch race. Mildren had a lucky break here- 300 yards from the start he broke a halfshaft’. 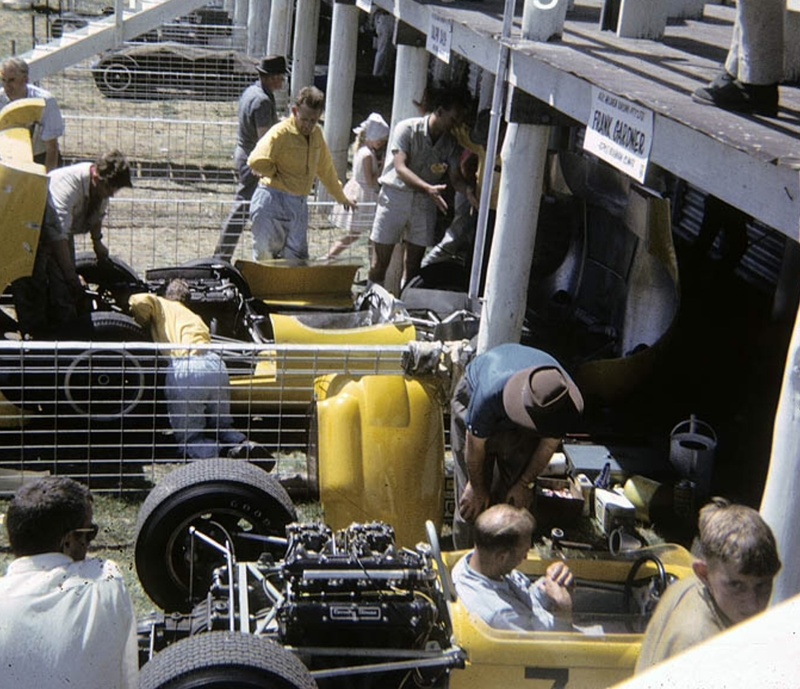 A half hour delay in the program caused by a fire after Ern Tadgell’s aero-engine Lotus 12 crashed and caused a small grass fire allowed Mildren’s repairs to be completed, he took the grid alongside Bib Stillwell, Cooper T51 Climax 2.5 and Davison. ‘The interesting aspect here was that, although the Mildren team carried every necessary spare part, the bushes of the top and bottom wishbones for the car had not been pre-reamed and required a lot of hand work in a very short time if the car was to be ready. Mildren himself had to take over- he had, after all, been building his own AGP cars since 1947- to get the work done…’ wrote Howard. ‘From the flag until the end of the race, Mildren and Davison duelled at speeds between 40 and 160 mph and for most of the time separated by a second or less. 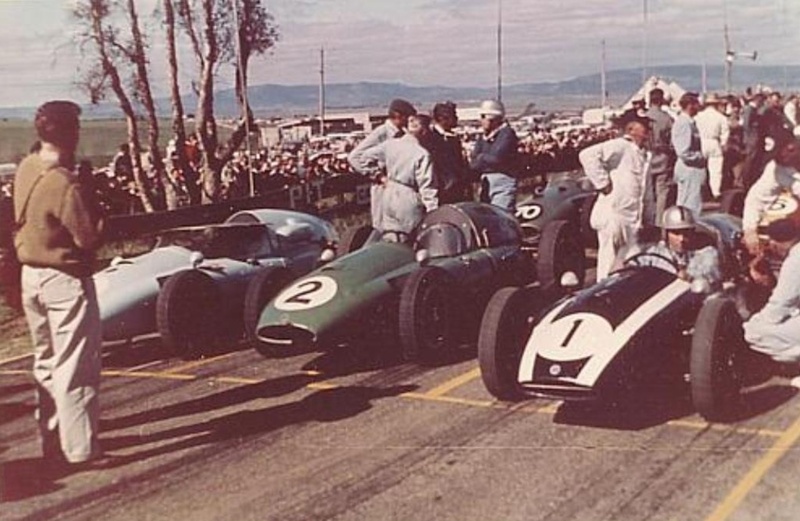 The small green Cooper Maserati sounded harsher and accelerated harder than the big green Aston which looked noticeably steadier through the corners. Mildren lost the lead in a spot of heavy traffic and then “butterfingered” his car and the resulting excursion into the outfield dented the Cooper’s snout’. Green ‘While Mildren did indeed grab the lead from Stillwell and Davison on the opening lap after making an understandably gentler start in second gear…a photo…showed Mildren’s unscathed car trailing the Aston Martin. Howard’s account explained that Davison grabbed the front running on lap 16 at Castrol Corner and that Mildren spun a lap later at Bardahl- perhaps caught out by traffic’. Davison had a 10 second lead, Mildren recalled ‘I did a silly thing- I had so much confidence that I eased off the throttle and dropped the pace by a second or two. When I tried to regain the time, I had to work very hard and told myself I had been a stupid fool. So I drove as hard as I could and eased back the time lost. It was not just a question of catching, but of course passing him’. McKay ‘ Mildren retaliated and gave chase in true Moss-like fashion. He closed the gap relentlessly and went ahead again when Davison overdid a corner. Averaging 95 mph, these two held the 25,000 paying customers spellbound. Many excellent performances tended to be overshadowed. Stillwell, his rivals drawing away at over 2 sec a lap, motored cleanly and rapidly in third spot- never challenging or being challenged. Behind him was a race long fight between Hall, Leighton and Glass…The leaders rushed past others as though possessed of immense speed and skill to match, everyone except Stillwell suffered the indignity of being “doubled”, some several times’. Green, ‘No mention is made of Davison regaining the lead within a lap at Mobilgas, or of Mildren retaking it at Castrol two corners later- but such was the case’. David McKay on the closing stages one of The Great AGP’s ‘Mildren’s engine , due to the damaged nose, was badly overheating and when Davison closed and went to the front just before the end it appeared as though the veteran driver would never realise his ambition, but in a finish to beat all finishes Mildren ducked inside Davison on the very last corner and in the long straight run to the chequered flag we could hear the Aston’s engine being squeezed as never before in a last effort to overhaul the Anglo-Italian car. Davison got the most out of the Aston alongside Mildren’s cockpit as the flag fell. “Mildren of Lowood” had won by 1/20th of a second’. 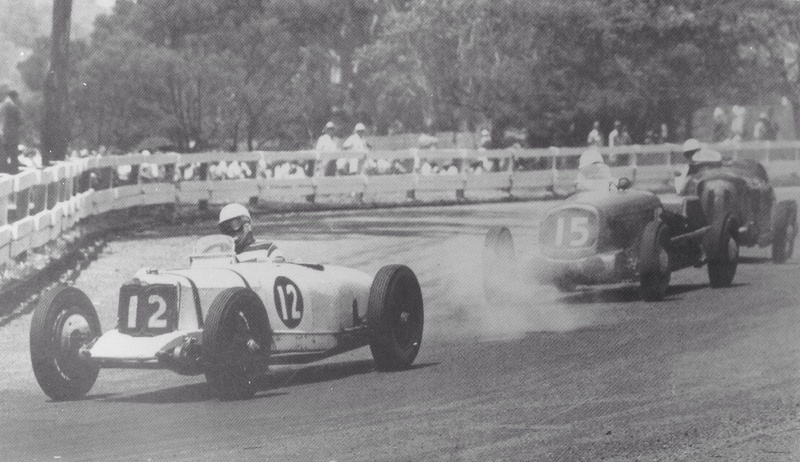 ‘If he never drives again’, McKay wrote ‘Mildren earned himself a place in Australian motoring history by his magnificent drive that day. It was a victory of the highest order- won from a champion and sportsman who made him fight every inch, every second of the way. Mildren now has a stranglehold on the Gold Star award- that and the AGP are the fruits of many years and thousands of pounds spent in the most exacting sport of all’. The Gold Star circus returned to Lowood again on the weekend of 4 September with Mildren again victorious, from Stillwell and Davison, albeit this time Bib was in front of Lex. It was another great race in which the lead changed about a dozen times in the opening 5 laps before Alec took the lead and held it. 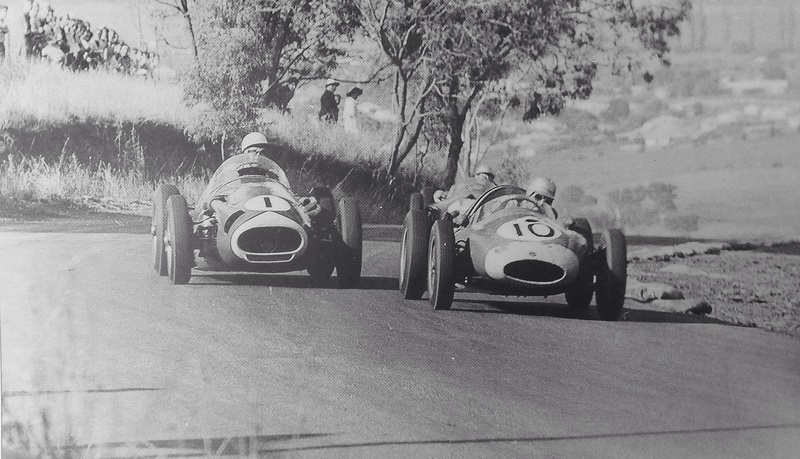 Brabham returned for the October Craven A International at Bathurst in October as 1960 World Champion. No way was he going to lose that race, he won from Patterson and Stillwell. All three drove T51’s powered by 2.5, 2.4 and 2.2 litre CC FPF’s. Alec failed to finish with a gearbox failure on lap 16. A spate of unreliability seemed to have set in with a duff engine at Port Wakefield during the Advertiser Trophy meeting the following October weekend. Lex started from pole and retired on lap 20- the race was won by Stillwell from John Youl, T51 2.2 and Keith Rilstone’s amazing Eldred Norman built, front-engined supercharged 6-cylinder Zephyr Spl. Very much an Australian Special story for another time. There was plenty of time to take the Cooper back to Canberra and have it well prepared in time for the Caversham, ‘Western Australia Trophy’ meeting on the 5 December weekend. There Alec’s long desired Gold Star title dreams were realised with victory from Stillwell, his car now fitted with a 2.5 litre FPF and Derek Jolly’s Lotus 15 Climax sportscar. Bib needed 12 points to stay in the title hunt and took the lead from the start but Mildren was soon all over him, pressuring the Victorian into a rare error, Bib spun off at The Esses. By the time Bib got his Cooper gathered up and returned to the fray Alec was a half-lap ahead, a lead he was not to relinquish. 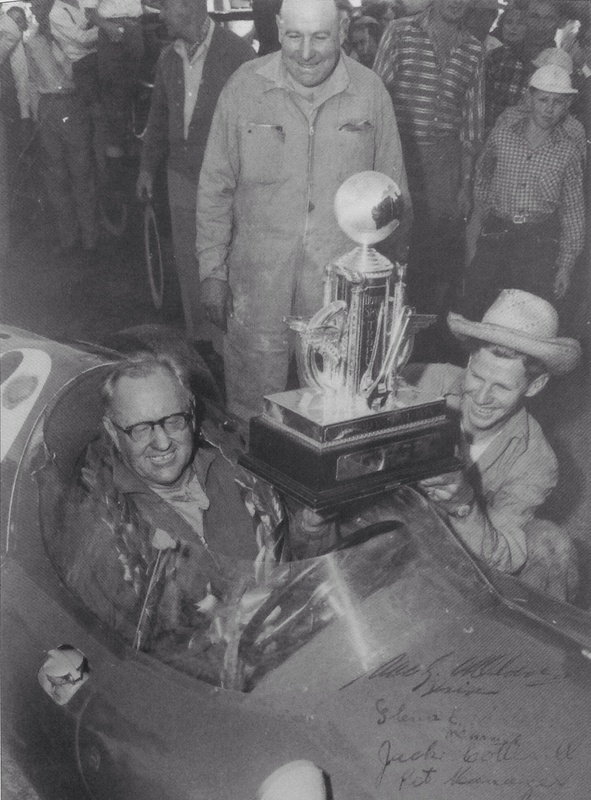 The team celebrated long into the night, the win a very popular one amongst his fellow competitors and race fans across the country- one of the sports perennial competitors had reaped the rewards he deserved. Mildren did not start the final two major meetings of the year with Bill Patterson winning the Lukey Trophy at Phillip Island and Stillwell taking the Warwick Farm Trophy the week before Christmas 1960. The final Gold Star pointscore was Mildren on 55 points from Stillwell and Patterson on 41 and 20 respectively. The successful businessman/racer considered his options for 1961 knowing that Stillwell, Patterson, Youl, Miller and Davison who had retired again- and come back again would be formidable competitors, some with 2.5 litre FPF’s fitted into the back of their Coopers. 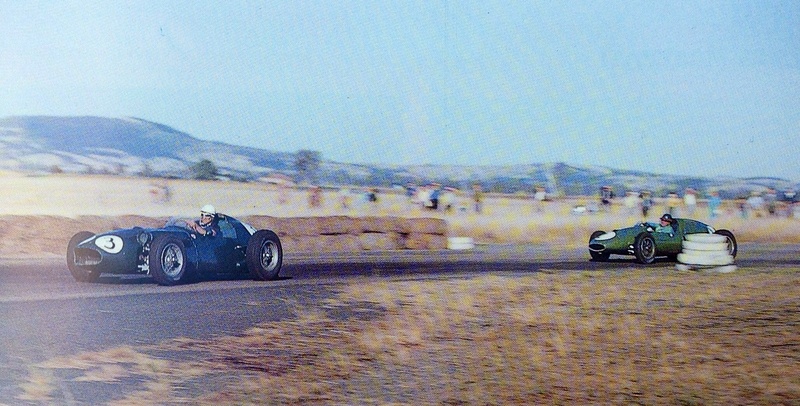 Clearly Mildren was at least considering a new car as the Cooper Maser was advertised for 5500 pounds in the November issue of ‘Australian Motor Sports’ but it did not sell so a new Maserati ‘Birdcage’ Tipo 61 2.9 litre engine and 5 speed Colotti Type 21 gearbox was fitted but not in time for the early season internationals. Alec retired in the Warwick Farm 100 with falling oil pressure, the race was won by Rob Walker’s Moss driven Lotus 18 Climax. 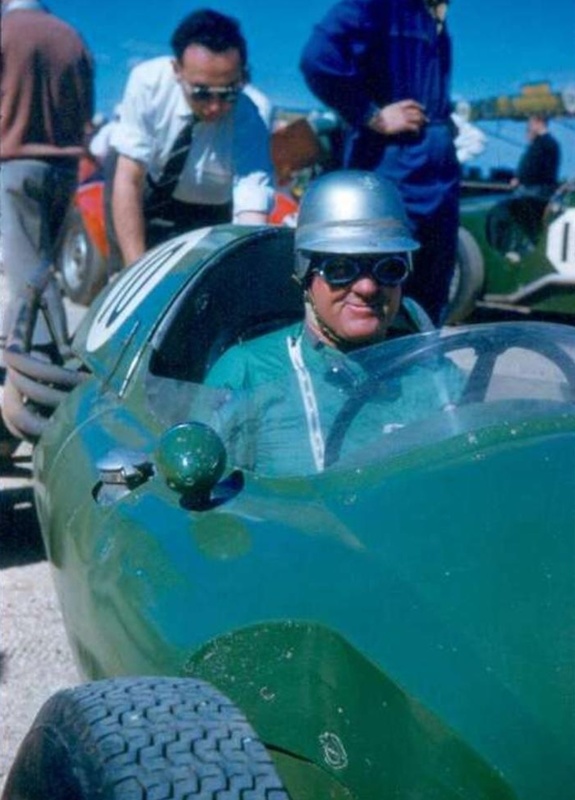 Arnold Glass had his first race of his Tommy Atkins built Cooper T51 Maserati 250S, a car he grew to dislike as much as he savoured and did so well in the Maser 250F which went before! The car was trailered to Ballarat for the Victorian Trophy meeting at Ballarat Airfield on 12 February. There Dan Gurney took the only international win for a BRM P48, Alec was 6th, a lap down on Dan, the similarly mounted Graham Hill, Ron Flockhart’s Cooper T53 with Stan Jones the best of the locals in his T51 2.5 FPF, 4th. Glass was 7th in his Cooper Maser. At Longford in early March Mildren was 6th, still with the 250S engine fitted with Cooper T51 FPF’s dominating- Salvadori won from Patterson, Youl and local boy Austin Miller. During the lead up to the Easter Bathurst meeting the Birdcage engine was fitted. Bill Patterson won the ‘Craven A’ Gold Star race convincingly in a run which would win him the 1961 Gold Star aboard his very quick T51. Alec was 5th behind Patto, Stan Jones, Stillwell and Glass. Alec felt the car was quicker than before but not very much so. In its new Birdcage/Colotti form he was 2nd in a low-key non-championship scratch race behind Bib Stillwell at Warwick Farm in May- in front of the Noel Hall and David McKay T51’s. Lowood had been a Mildren happy hunting ground more often than not in the preceding years, and so it was he was 2nd in the Queensland Centenary Road racing Championships Gold Star round in June behind Patterson but ahead of Jones. And in low key style, that was it for Alec’s racing career, he quietly retired to focus on his business and establishment of Alec Mildren Racing Pty. 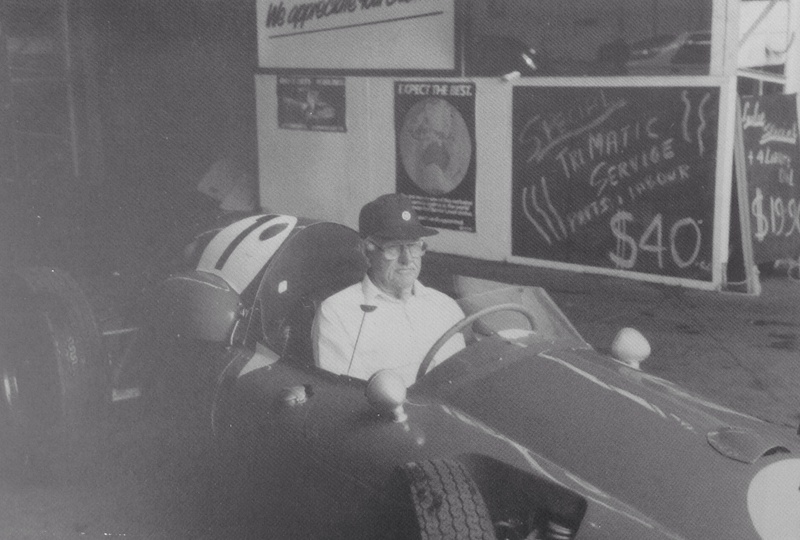 Ltd as a team owner- his and David McKay’s Scuderia Veloce concern created the first professional racing teams in Australia. Mildren’s exploits and those of his drivers will be a nice Part 2 of the Alec Mildren story. In September 1961 the Cooper, fitted with the 250S engine was sold to Ross Dalton on a time payment deal. 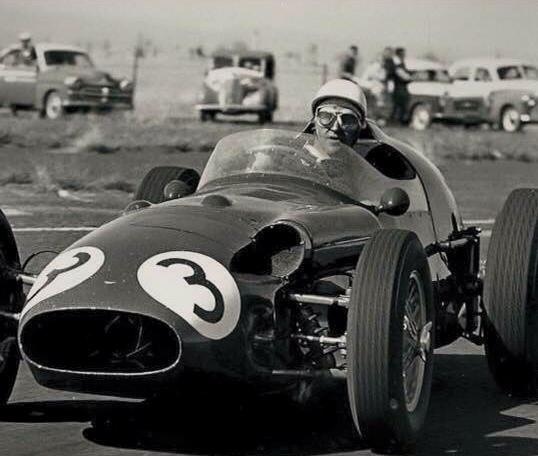 In his first meeting with the car at the shortlived Toowoomba Middle Ridge road circuit he lost it in practice- locking the front wheels, broadsided some corner posts and somersaulted over the haybales, the car was ‘not too badly damaged’. Whilst advertised again with the 250S engine and Colotti box in AMS in February 1962 Green’s book says the car reverted back to Alec after the accident. 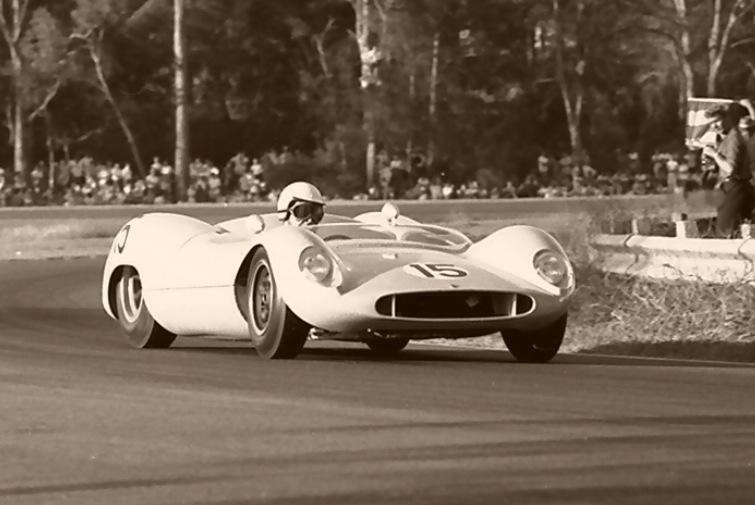 Entered in the 1963 AGP at Warwick Farm for Frank Gardner the now ‘old nail’ T51 Maser was outgunned by much more modern Coopers, Brabhams, Lolas and Lotuses but gave FG valuable big-car experience before he returned to Europe where he was ‘on the climb’. He DNF for unstated reasons. 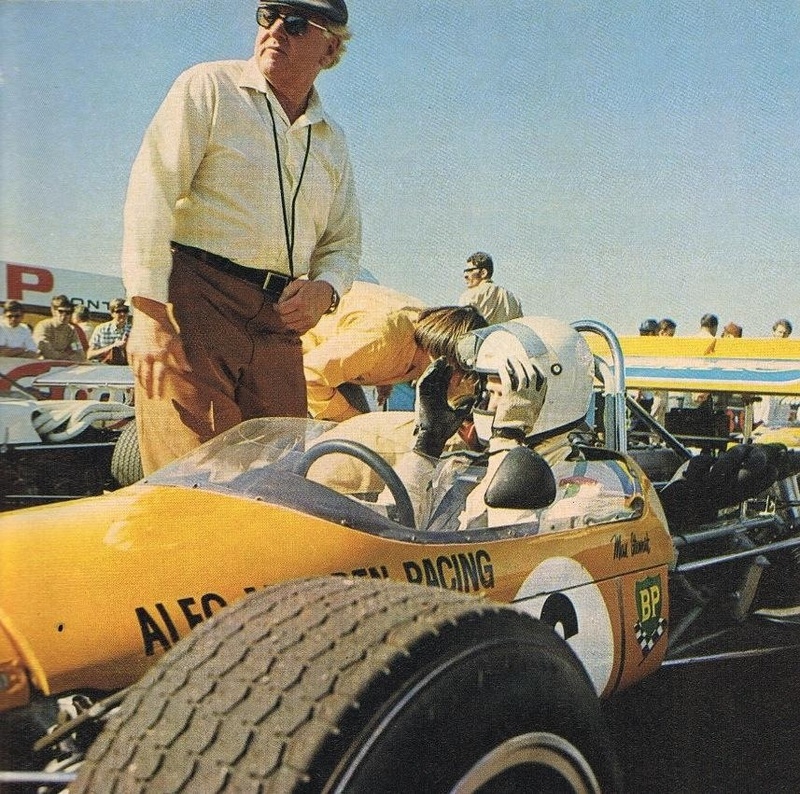 Gardner’s pattern of driving for Alex every Australasian summer at the end of his European season extended all the way through to 1969- and to the end of FG’s single-seater career post his time with Alec’s team through until 1972. At that stage it was not uncommon globally for uncompetitive Cooper T51’s to be re-birthed as sportscars, perhaps Roger Penske’s Zerex Special (see my article by keying the name into the primo search engine on this sites front page) is the most famous of these exercises. Abbey and Mildren’s variation on the theme was for the core components of the car- T61 2.9 litre engine, Colotti box, suspension and brake componentry to be built into a car constructed by Rennmax’ Bob Britton who ended up having an enduring, very successful relationship with the team until its end at the duration of the 1970 season.In essence Britton’s car was a Lotus 19 chassis clone with a 23 style of body. The car was immediately quick in the hands of Ralph Sach, Frank Gardner and Kevin Bartlett who won the 1965 Victorian Sportscar Championship in it. Its life with the Mildren team ended during the 1965 Australian Tourist Trophy, when, with Gardner at the wheel the engine let go in the biggest possible way spreading expensive alloy shrapnel on Lakesides main straight. At that point the car was advertised and sold to Ross Ambrose (he of Van Diemen and Marcus Ambrose fame) who renamed it, with Mildren’s agreement, as a Rennmax. Fitted initially with a 2.2 litre Coventry Climax FPF it later had installed the ex-Scarab/Stillwell Buick 3.9 litre V8 by Geoff Smedley, the car raced on and still exists. What about the chassis of the Cooper you ask? Badly corroded, twisted from a few accidents and by then living in Abbey’s coastal Narrabeen home garage, it was dumped at the Avalon tip circa June 1965- the cars simply were not worth then what they have been since the mid-seventies! Bits not used in the sportscar build went to other Cooper owners, especially in Tasmania where a few of the Oz T51’s ended up. The 250S engine sold to Terry Clift in 1966 and played an important role in the cars resurrection when he sold it, in badly damaged form, to Sydney’s Paul Moxham who had started the long process of reconstruction of this famous, clever Australian Cooper. The chassis commercial airline pilot Moxham found for the project was believed to be one of two created ‘in period’ by Len Lukey who fabricated a T51 jig whilst the 1959 Gold Star winner was racing a T51- not the only such jig in the country either! Moxham created a fibreglass body from a mould taken off the Noel Hall T51 in 1959 by Bob Britton and Chris Conroy- Sam Johnson of JWF Fibreglass made the body. The car was assembled gradually in consultation with Mildren, Abbey and Tim Wall with new wishbones, bushes, front axles, discs, hubs with the engine and gearbox fully rebuilt by 1985. All alloy, DOHC, roller follower, 2 valve, dry sumped four cylinder fed by two 48mm Weber carburettors, alcohol fuel. If Part 1 is anything to go by, roll on Part 2! Glad you enjoyed it. I’m afraid I’m hopelessly biased- Alec Mildren, Frank Gardner, Max Stewart, Kevin Bartlett, Glenn Abbey, Ian Gordon and Stu Randall can do no wrong as far as I am concerned! Another great read, lots of wonderful period photos. How do you find that stuff! Fabulous car, the Cooper Maserati. Alec’s race career is a bit before my time, however I did get to see the recreated Cooper at a Historic Meeting in 1988. Glad you enjoyed it. I’ve learned a few research skills since I started playing around but the photos are always the articles inspiration. In this case magic shots by John Ellacott and Ron Lambert- the latter shared by Ron’s son James. I had a feeling this one would hit the spot with you- a significant part of Maserati’s racing history and achievements in Oz. So where is the Mildren Maserati now? I loved that car in its original format, although I think that had aerodynamic deficiencies. I’ve lost track of the owner- it became a Rennmax- with Alec’s consent, when Ross Ambrose bought it. As you probably know it was Traco Olds powered for a while and eventually restored in, I think that form. The Maser T61 Birdcage engine went kaboomba @ top revs in fifth gear @ Lakeside during the ’65 ATT with Frank at the wheel which KB related on TNF or Facebook. I’ve enough photos to do a quickie on the car- will add it to the way too long list of ‘to do’s! I spoke with a bloke at Morgan Park a couple of years ago. He was in the process of restoring the car to the Traco Olds era. Can’t remember his name but, he was from Queensland. Should be finished by now but, it hasn’t showed at any historic meetings so far. I’ve certainly never seen the car race in any of its forms- be a nice thing to have in any of its formats too- but I’ll take it as originally built thanks! I agree with Terry, another unique Mildren car. Wonder why they never bothered to fit the 250S engine after the 2.9 destroyed itself? Would love to see the Mildren Maserati restored back to original, however I suspect it would take someone with very deep pockets for that to happen. Perhaps with some V8 powered sporties coming onto the local scene (the Elfin 400’s were being built throughout 1965) Alec figured it was time to move the car on. I wonder when they first raced the TZ2? , that was a better fit with the Alfa business than the Mildren Maser. Thanks Shane- a topic dear to my heart really- a very enjoyable one to research and write! The Barry Green ‘Alec Mildren Story’ is a great little book not just on Alec but on the local scene at the time- there would be the occasional one on Ebay I suspect worth getting. I’ve got photos and bits of information under all sorts of hollow logs! The photos are always the key- the start- the shots by John Ellacott and Ron Lambert were too good not to do something with. I had been thinking about something on Alec for a while but the two detail shots of the business end of the T51 were the catalyst for all that followed. The amount of information on all manner of topics being exchanged on the internet is staggering, but I guess part of the skill is knowing where to look. Google is just the start!